Shinnecock Hills Retreat -- Steps to the beach with king Bed and hot tub! Relax your days away poolside in a setting that brings the outside in. Enjoy relaxation in the hot tub and large outdoor shower. Professionally designed with beautiful gardens. Ten minutes to Southampton and Hampton Bays Villages. Walk to the bay side beach or take a ten minute drive to the beaches in Southampton or Hampton Bays. Heated pool, hot tub, cable tv, WIFI, three bedrooms, two full baths, sleeps six, new kitchen and appliances. Private setting on a quiet block but minutes from all the action in Southampton. Large sunny deck for entertaining. 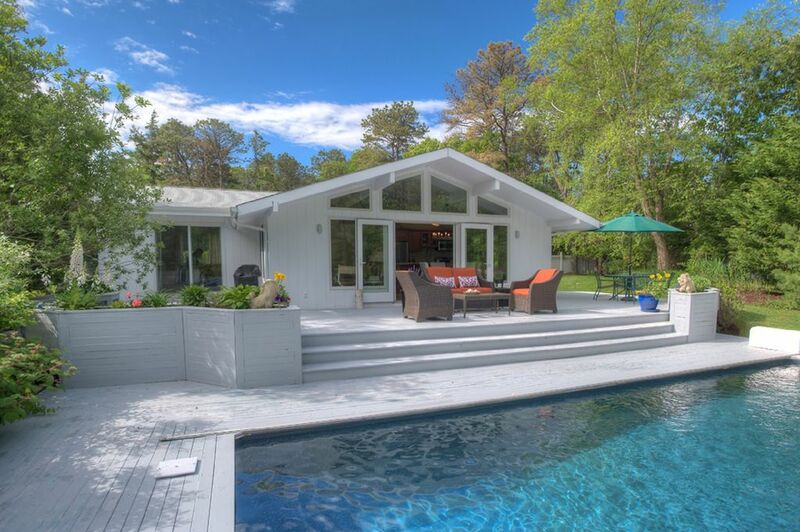 Close to the wine country in both the Southfork and Northfork of Long Island. Entertain your children at the Riverhead Aquarium and Tanger Outlet shopping which is 20 minutes away. Looks into untouched wooded area. Eight minutes from the center of Southampton Village and all of the shops and restaurants. I provide enough to get you started. the table can have a leaf added to accommodate 6 people. they can be rented at Spellman's Marina which is 5 minutes away by car. there are free public courts in the town of Southampton at the High School and several private clubs in the area. My friend and I had a wonderful time in Shinnecock Hills for a long, restful weekend. I was here last August and loved the manicured property -- this mid-Century style house is meticulously clean and well equipped with all the bells and whistles. It's 7 minutes from Southampton and a 5 minute walk to Shinnecock Bay -- it makes for a fun weekend even off season. We went to Wolfer Vineyards, dined waterside at Cowfish which had a hip band on Friday night, shopped at the store sales and had brunch at a sidewalk cafe in Southampton Village. I also enjoyed grilling and cooking at home. Nancy & John were very helpful in guiding us to the best nightlife and beaches. We were so pleased to have Bruce back at the house after welcoming he and his family last summer. Over the winter, we repainted the interiors in addition to putting in new recessed lighting. I also updated all of the linens and added some additional storage in the kitchen. I am happy to hear that it was such a nice weekend getaway for he and his wife. Dirty & Dangerous - Stay Away! I have rented from VRBO in the Hamptons numerous times and have never had an issue, however this particular home & homeowner have been a nightmare to deal with. 1. The house was not clean upon our arrival. We found dead flies and broken glass on the ground. My 3 year old son cut his foot on the broken glass which ruined our first night there. 2. The back door to the pool is broken (can just be pushed open) and there are no pool alarms, making it very unsafe for families with kids. 3. The owner's personal junk is in every drawer, nook, and cranny. There is nowhere to store your stuff. 4. There is black mold in the washing machine. 5. The back deck, pool, and hot tub were full of leaves and have not been cleaned prior to our arrival. 6. There was half a pot of days old coffee and old food in the fridge when we arrived. These renters were threatening me that they would write a bad review if I didn't give them a free night -- which no one does on a holiday weekend. They did got charge back of $1380 from Amex after making these false charges. It was overruled once my documents were submitted and I got full payment. They only paid a $250.00 security deposit and they agreed that I should take $125 for an early check in. After their stay, there were red wine stains on the bar stool cushions, the grill was filthy & it actually burst into flames, singeing the wall which had to be fixed. I therefore kept the remaining $125 which really didn't cover the damages. Prior to their arrival, I spent $200 having the house cleaned, plus an additional $125 to have the couch steam cleaned. It was immaculate. I'm not sure where the shard of glass came from as nothing was broken when I arrived after my last guest left. Also, I was walking barefoot doing last minute checks and was fine. They called about a shard of glass 4 hours after check-in & may have broken something themselves. We have a first aid kit and it was apparently minor since there was no doctor's visit -- insurance covers this BTW. My pool and hot tub were cleaned at a cost of $100 the night before. I have used the same house cleaning service for 5 years and never had a complaint. I had made myself a cup of coffee while I waited to greet them -- for the coffee filter, I take responsibility. We also leave condiments which most guests appreciate. I referred the complaints to John, my house manager since Mr. G harassed me throughout his stay. He just seemed like an unhappy guy. There is saying that "no good deed goes unpunished" and these people were clearly an example of that! Beware of these renters!!! My Bose sound was also broken and unrepairable & the grill had to be replaced. I look forward to each rental season and do whatever is necessary to insure the comfort of my guests! Beautiful grounds and great location! My family had a wonderful time at this home. I would give this 4 1/2 stars. Pretty grounds with a lot of amenities. The home was well appointed and comfortably fit me, my wife and two kids. Nancy was very responsive to our requests and always happy to help out when needed. Thank you for making sure we were well taken cared of. Loved the heated pool and the Jacuzzi. Lots of grass as well to play on. Very relaxing and quiet area with South Hampton, Hampton Bays and multiple beaches just minutes away. Just make sure to apply bug spray while you are there just because there can be mosquitos early in the morning and evening. My only suggestion would be to not plant flowers right next to the outdoor dining room table or at least move the table to another location. Very pretty but attracted a lot of bees and made it a challenge to eat outside at the dining table because my four year old is scared of bees. Otherwise everything was great. Thanks Nancy! This time of Year the flowers are in bloom so it’s a bit of a trade off with the bees. I did ask my gardener to trim back the flowering bushes and we moved the table. The yard is sprayed for mosquitos and ticks once a month. Personally, I’ve never had a mosquito bite likely because the house is at the top of a hill away from swampy areas. Lovely, well appointed home and yard! Our family of 4 and dog stayed for a week and had a wonderful time. The pool, outdoor space, hot tub and landscaping made for a very relaxing retreat. The decor was inspired. Proximity to great dining and beaches was the icing on the cake. Highly recommend! Spent a long weekend in this Hampton Bay retreat. Cozy home with great outdoor space. Beautiful landscape to enjoy while in the pool and hot tub. Nancy was very responsive and quick to get the issues with the hot tub fixed. John had awesome recommendations for places to see. Location was great to get to Southampton and Sag Harbor. Loved Cowfish, Rumba and Edgewater right around the corner and Enjoyed the wine stand at Woffler Estates. This home is absolutely adorable, and it has everything. Nancy was a wonderful hostess, and was very helpful with anything that we needed. We loved this home, and really hope to return soon! Steps from Shinnecock Bay beaches and boating -- 10 minutes to the pristine Atlantic Ocean beaches in Southampton. Take a short drive to the center of Southampton Village and all of the shops and restaurants.